The Swing Bridge opened 15th June 1876. Opened: 15th June 1876 (There was no official ceremony). Designer/Engineer/Builder: Sir W. G. Armstrong & Co.
Traffic: Road & pedestrian. Length: 560 ft (170.8m). Width: 47ft 6" (14.48m). 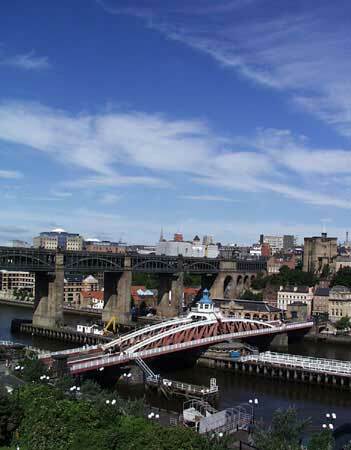 The Swing Bridge was built on the site of the Roman and Medieval bridges which crossed the Tyne at this point. During its construction, two Roman altars were dredged from the river. Dedicated to Neptune and Oceanus, they probably belonged to a shrine built to protect the Roman bridge from the Tyne's tides. The largest opening bridge of its kind when it was opened in 1876, its hydraulic opening action was originally driven by steam pumps but these were replaced with electric pumps in 1959. The bridge was needed because the small arches of the old stone bridge prevented large, sea-going vessels access to Lord Armstrong's expanding Elswick Works. It has opened more than 250,000 times, in recent years it opened mostly for routine maintenance. But since the opening of the Gateshead Millennium Bridge it now opens to allow river sightseeing boats to pass by.